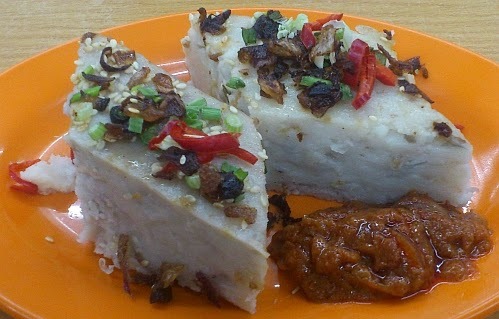 Steamed yam cake and steamed radish cake (1 piece - MYR1.50 each).so total is MYR3. There are many small cubes of Yam inside the yam cake. Yummy, yam cake is my favourite. Good to know. Do you make them yourself? I like!!! In Penang, they serve with hay kor (prawn paste). Nice! In kl it is served with tim cheong. Woo tau kou! Nice! I like it with extra extra sweet sauce.. If the sauce is nice, I can 'drink' with the yam cake too, haha..
Mun, your plate of yam cake with the sambal paste looks very good and yummy. I love yam cake! It is really good but it depends. Some vendors put more flour than yam/radish. I would ask for extra sambal. I know what you mean. This one is nice, more yam than flour. Oh, cannot eat yam when pregnant? They look kinda identical....don't they? I like both... radish and yam... yes, two will also be enough for me.. hahaa..
Apart from the morning wet market I don't see this selling in food courts in malls so far.